This chapter examines a variety of sociopolitical configurations in which the Nigerian experience of federalism was forged. It suggests that the ongoing Nigerian experiment with federalism can be understood by confronting the confluences of militarism, ethnicity and religion. In addition, the Nigerian Civil War has also had a tremendous impact on how the contours of Nigerian federalism were shaped. 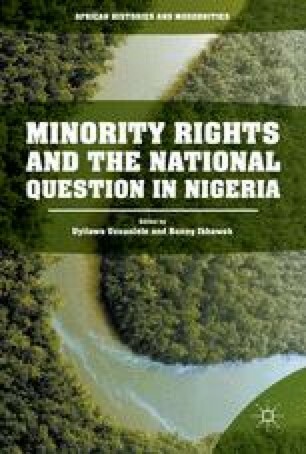 The chapter begins with an examination of federalism itself as it relates to the Nigerian nation and then moves on to address the political instrumentalization of religion and ethnicity. Indeed, the significant political moments and categories such as militarism, ethnicity, religion and the imperatives of the nation-building project play against one another in a context that is never even and which is shaped more by factors of political expediency than anything else. In addition, the trauma of the Nigerian Civil War is partly responsible for the various pressures for the federalization of the polity.